Christopher Brown began his association with George Collins, PA as an Associate Attorney in 2017. Originally from Ohio, Christopher graduated from the University of Toledo with a B.A. in Political Science in 2014. Christopher attended law school at Campbell University in downtown Raleigh, NC. While in law school Christopher earned honors for his performance in his Products Liability class as well as his participation in the Campbell University Community Law Clinic. Christopher was also named as a Who’s Who Among Students in American Universities and Colleges Honoree during his time in law school. 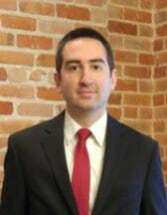 Christopher is licensed to practice in North Carolina and he currently practices Criminal Defense and Family Law.